The National Botanic Gardens of Ireland are an oasis of calm and beauty, and entry is free. A premier scientific institution, the gardens contain important collections of plant species and cultivars from all over the world. The National Botanic Gardens in Dublin are located in Glasnevin, just three kilometres from Dublin City Centre, and are famous for the exquisitely restored historic glasshouses. 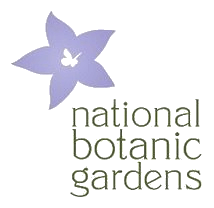 The National Botanic Gardens in Wicklow are located in Kilmacurragh, where the milder climate, higher rainfall, and deeper, acidic soils of this historic Wicklow garden, provide a counterpoint to the collections at Glasnevin. The two gardens have been closely associated since 1854. Click here for further details on tours in Glasnevin. Tours in Kilmacurragh are available during the summer season; click here for more. Browse the latest below, or see the full calendar at this link. Click here for public transport and driving directions. Click here for transport and driving directions.